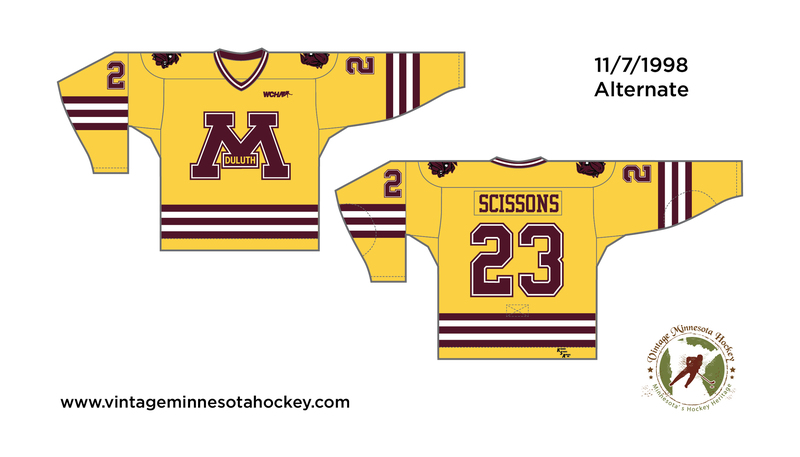 BY JIMMY GILLIGAN | The Statesman The UMD men’s hockey team hasn’t had an alternate jersey for six years. I think it’s about time that changes. Right now they’ve got two different styles: a home white and a maroon away. Personally, I am a big fan of both of the designs, but I want more. Many teams have a third jersey, including Minnesota State, University of Minnesota and even the UMD women’s hockey team, yet UMD men’s hockey doesn’t. Not only are they another source of revenue, but alternates often showcase something unique about the team’s city, taking risks in their design to the delight, or sometimes disgust, of fans. Perhaps the reason the men’s hockey team is hesitant to create a third jersey is a past third jersey mishap that gave “doing something different” a bad name. In 1998, UMD unveiled a third jersey which featured a large “M” on the chest, spelling out Duluth in the middle of it. Even as it was meant to be a throwback to a past UMD logo, the Bulldogs were actually booed by the home fans when they took the ice wearing them. “It was a retro look, but if you were up in the stands, all you saw was the ‘M’,” longtime assistant athletic director and director of Sports Information, Bob Nygaard, said. Nygaard, who was at the game, remembers a quote from Wisconsin University’s head coach at the time, Jeff Sauer. Since that third-jersey catastrophe of ‘98, UMD has sported three different alternate jerseys. All three had a gold base as if we’re the Golden Bulldogs, creating a knockoff of the brand the Twin Cities campus uses. As of late, UMD has made strides in developing a unique brand. Their current home jerseys (unveiled last Fall) feature a unique Aerial Lift Bridge shoulder patch. Garner initially developed the Lift Bridge logo, which is also now used on the jerseys of the women’s team. 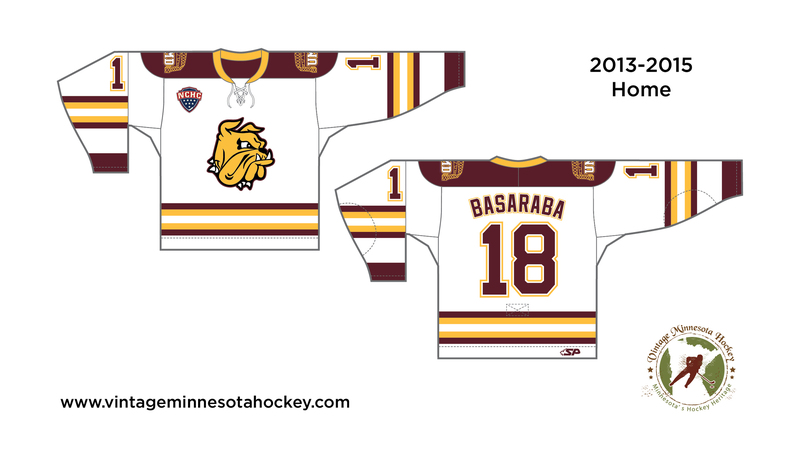 It was UMD’s third new jersey design since 2010. Over that same span they haven’t had any alternate uniform kits. A lot more goes into developing a new jersey than just picking a color and adding stripes. “Some of the (decision is financial) but it’s kind of between coach (Sandelin) and I. We’ve had some ideas, we’ve just had some little bumps in the road,” Garner said. He also noted that he takes input from the players and that university administration has a say in things. There are a lot of hoops to jump through for the Bulldogs to get fresh threads. Garner believes that any alternate jersey the Bulldogs wear in the future will pay homage to a previous design. “There are a lot of hockey people here who like a classic look, so if there was something it would probably be towards a throwback,” Garner said. He said they will likely have an alternate jersey out in the next few years. As a handful of NHL teams use the shoulder patch on their regular jerseys as the focal point of their alternates, we decided to do the same with the Lift Bridge logo. We avoided gold as the main color—we’re not the Golden Bulldogs, right? 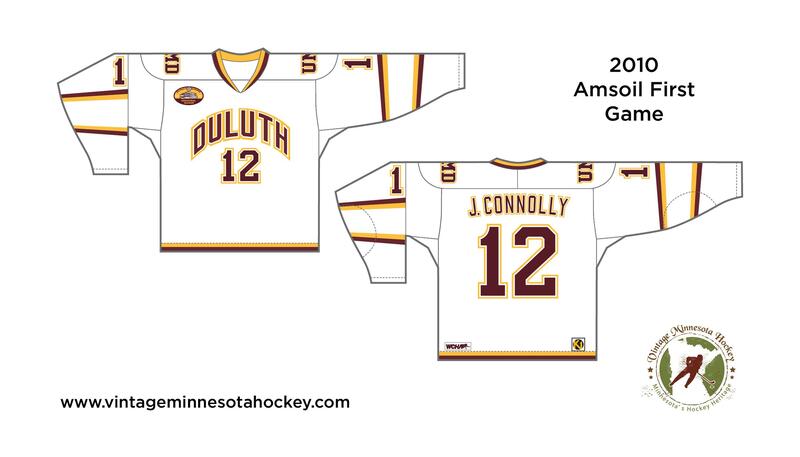 Instead, we borrowed a simplistic but striking design from the uniforms that UMD wore in their inaugural game at Amsoil Arena in 2010, adding a stripe on the bottom for balance. The clean look of the two shoulder stripes leaves the focus on the Lift-Bridge logo. It’s different, yet digestible; unique, but wholly Duluthian. The bridge logo’s lattice work could be a risk as a focal point, but we believe it’s worth the reward. Feb 5 What's on your playlist?